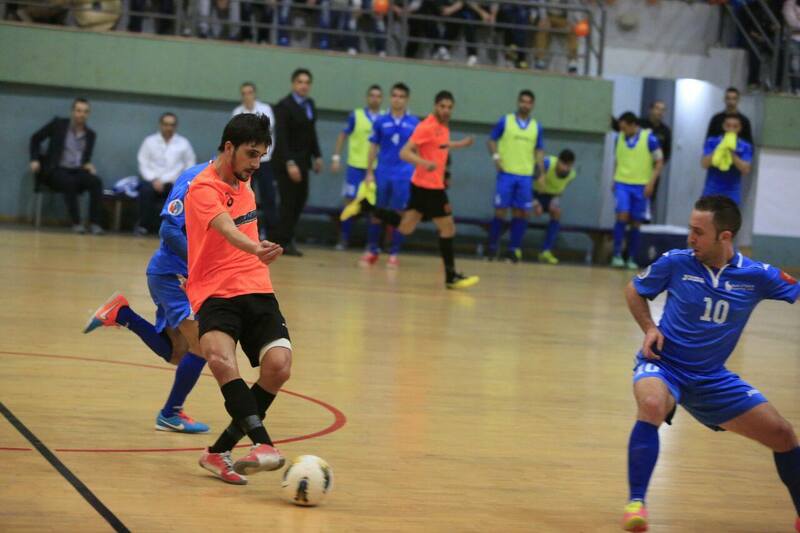 The crowning of the 2014/2015 Lebanese Futsal Championship champion was postponed one more game after Bank of Beirut tied the series with rivals Al Mayadeen 2-2 on Sunday, taking the series into the fifth and final match. During the fourth game of the series the Sadd Stadium, again, was full with supporters coming from all across Lebanon. This match saw the return of Bank of Beirut’s Serbian coach Dejan Djedovic, who came back to his team after an absence that stretched for a full year, due to misconduct during last year’s final. Bank of Beirut players entered the game, knowing that winning is their only option, after losing 2 games in a row, the second being on their home court. Rudolpho Da Costa’s absence, due to injury, did not affect the determination of his teammates in finishing the game in their favour. Ahmad Kheireddine scored the opening goal for Bank of Beirut during the first half while Al Mayadeen players failed to enter the lockers with a goal scored in return. The second half turned to be much more intense than the first and 5 goals were scored through it. Alee “Sisi” Tneish scored the second for Bank of Beirut before his team entered the danger zone with 5 cumulative fouls, a mistake Al Mayadeen players could’ve easily taken advantage of, but couldn’t, thanks to the heroic saves of Hussein “Ashta” Hamadani. Ashta was fully focused on Angellot Caro and Karim Abouzeid, when the 2 missed on their penalties shot at the BoB net guarded by the best player of the night. Al Mayadeen’s goalkeeper Tarek Taboush, who managed to show some tough skin throughout the series, made the deadly mistake of passing the ball to Vladan Vesic, who, in turn, punished the keeper by scoring the ball in his net and giving his team a 3-0 lead. Al Mayadeen’s coach Mohammad Dakka, had no choice but adapting the power play strategy, which almost paid off when kassem Ezzedine and Angellot Caro scored 2 consecutive goals. The same strategy that gave Al mayadeen some hope, killed them as well when Alee Sisi scored his second goal for the night into an empty- goalkeeper-less net. This goal was the last for Alee Sisi for the season, the final game of which he will miss due to his third cumulative warning. The fifth and final game of the series and of the season will take place on Tuesday at 17:00 in the Emile Lahoud Stadium.